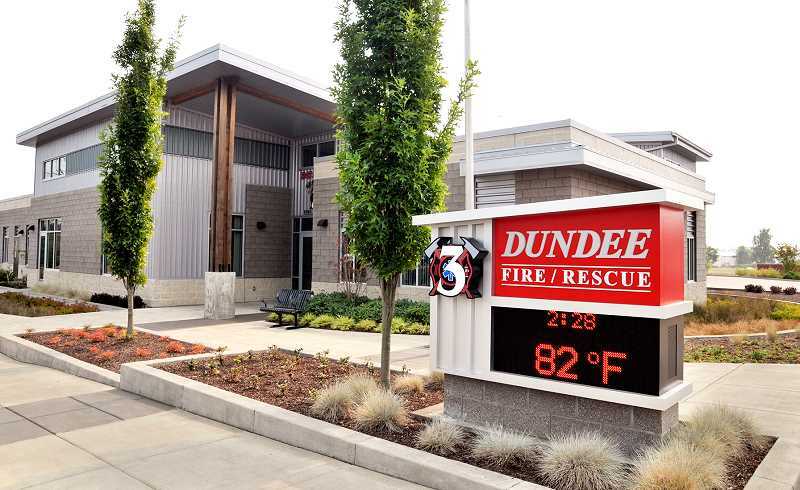 Construction on the Dundee fire station was completed in 2015, but the city ran into some problems with the roof right away and has been seeking redress with contractor Baldwin Construction ever since. That included entering into mediation in spring 2017 to negotiate a repair agreement. Things are finally moving forward, though, after the Dundee City Council gave the go ahead July 27 to exempt competitive bidding for the repairs, mainly to save time so the project can be completed before the dry season ends. "We are happy with the mediation process despite the length," City Administrator Rob Daykin said. "We finally reached a settlement and the city council did authorize the mayor to sign the agreement and that's been forwarded on and we expect the other parties to sign. The city, under the arrangement, is to be provided the funds to put into effect the repairs that the settlement was based on." The city has selected contractor Porter Construction to do the repairs. They were involved in the bidding process during the negotiations and mediation to gather estimates and determine the time required to complete the repairs. The exemption to invite bidding was requested to save both time money. The dispute started during the warranty period of the new construction. Issues with the roofing were brought to the attention of Baldwin Construction, which denied responsibility. "As we got toward the end of the project (we noticed) that there was evidence of moisture problems in the ceiling and seams and the cracks where the walls meet the ceiling in various areas," Daykin said. From that point, the city initiated a lengthy and formal process to address the issue. The city hired Penel Bush to do some investigative work, who found some indication of moisture penetration. Afterward, they invited Baldwin Construction to attend the findings to review, observe and ask questions. Ultimately, the city felt that the problem was caused by Baldwin Construction and decided to enter into mediation, hiring Jim Omundson to review and point out anything that may have been missed during the negotiation process. From the bids reviewed during the mediation and settlement process, Dundee opted to hire Porter Construction to do the repairs based on budget, engineering and specialized experience. "We could have just taken the money and said, `OK, that's fine' and drafted up our own specifications and hired our own architect, and go out to bid and by the time you do that it's going to be October," Daykin said "We are anxious to get this work done this summer." According to the city, the number of available qualified and experienced bidders for the project is limited, as are city funds to plan, design and construct it. The city does not expect to have additional funds for the project and no definite start date. "Once the contract's signed the plans will need to be sent for a planning review and approval," Daykin said. "The contract is signed with the architect and we are still waiting for Porter Construction (to sign). The hope is that the amount of work that was identified through (mediation) and Porter providing the cost assessments, that is going to be within the amount that the settlement agreement is covering and some left over to cover the prior costs for the attorney fees and mediation cost that the city has already expended." The fire department will be fully operational during the course of repairs and work on the roof structure will be in phases. The city may, however, need to relocate some departments and services from the fire station during construction, Daykin said. "The good thing about this is that, unlike the problem at the Portland Community College facility, we were able to catch this right away, see the problem, recognize the problem and go into mediation fairly quickly," Daykin said. "I say quickly, it took over a year, and come up with a solution that we think is going to work … Now we have this tight window to get this work done before the next rainy season." Although roof repairs will start soon, problems with new fire station are not over. An issue with the concrete slab floor, which was impacted by a torrential rain when the construction company was midway through its original pour, have also be identified, but won't be addressed until after roof repairs are completed. "They tried to rescue as much as possible, but from our observation, the quality was not achieved and we went back and forth on possible solutions with the contractor," Daykin said. "We kind of reached a tentative settlement and the roofing came up and interrupted these discussions."